Like the Haitian revolution before it, the Cuban Revolution of 1959 and its leader, Fidel Castro sent fear and trepidation through the hearts of the Caribbean’s rulers of the day. The socialist People’s National party (PNP) as the party in power of the British Jamaican colony within the Federation of the West Indies still retained memories of its exorcism of the supposedly communist 4-Hs (brothers Ken and Frank Hill, Richard Hart and Arthur Henry). 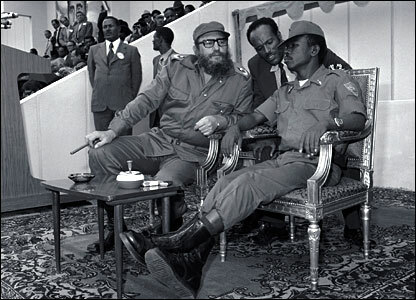 Fidel Castro and Mengistu Haile Mariam, on the Ethiopian royal thrones after Emperor Haile Selassie's overthrow. Rastafarians or “beardsmen”, already a scourge of the society were now identified with the bearded Cuban Marxist. Jamaica and Trinidad and Tobago gained their independence from Britain in 1962 and for several years after the revolution the region’s relations with Cuba were as a transit point for refugees fleeing to Miami and rightwing political party fear factor against left wing rivals. Jamaica and its anglophone cousins were in lock step with the US embargo on trade and travel to Cuba. While left leaning parties had always dominated Guyana’s politics prior to its gaining independence from Britain in 1966,the country had not established diplomatic ties with Cuba nor did Barbados, which also gained independence in 1966, where the democratic socialist Errol Barrow was in power. All that would change in 1972 after Michael Manley came to power in Jamaica. Manley intended to push a democratic socialist agenda and in a Caribbean Community (CARICOM) initiative Barbados, Guyana, Jamaica and Trinidad and Tobago established diplomatic relations with the Republic of Cuba on December 8, 1972. While the relationship with Manley was fraternal and Jamaica gained tremendously more from the partnership, it was not smooth sailing. The then opposition JLP, firmly in the US camp under Hugh Shearer and the Edward Seaga was resolute against the relationship and cited instances of Cuban interference in Jamaica’s affairs. If the Ras Rafari had in any way embraced Castro in the past by the 1970s with the overthrow of HIM Halie Selassie by Cuban/Soviet backed Marxists, would relegate socialism to the derisive category of an “ism”. Castro’s visit to Addis Ababa, where withDerg leader Mengistu Haile Mariam, he sat on the royal throne, did nothing to change socialism’s status as “devil philosophy”. While scores of Caribbean nationals joined the hundreds of international students doing medicine on scholarships in Cuban universities, gained primarily through affiliation with local left-wing organizations, it was the Grenada revolution of 1979 that split the Caribbean into pro- and anti-Cuba camps. Havana backed the Maurice Bishop-led New Jewel Movement that ruled for four years until it imploded with the bloody execution of Bishop and some of his colleagues by hardliners within their party. The 1983 revolt, which Castro reputedly did not support, resulted in the US-led invasion of Grenada, on the invitation of a coalition headed by the leaders of Dominica, Eugenia Charles, Barbados, Tom Adams and Jamaica, Edward Seaga. Ronald Reagan termed it a rescue mission for US students at an offshore university but it was also to disrupt a gift airport being but by Cubans, that the Grenadians said was to expand its tourism but which Washington saw as part of a military axis linking Havana to southern Africa where Cuban forces were assisting in the continent’s liberation struggles. But by 1998 Castro, who had instructed Cubans in Grenada not to take up arms against the US/Caribbean forces, would gain a reprieve from the very leaders who had vilified him. Grenada’s Prime Minister Keith Mitchell greeted Castro as an old friend, gratefully acknowledged the Point Salines International Airport and Castro was even allowed to dedicate a monument to Cuban construction workers who died in the unequal battle with U.S. troops. In Jamaica, Grenada and Barbados, Castro met with government officials and attended closed-door sessions with businessmen interested in capital investment in Cuba. The day after the announcement of Castro’s decision to step aside as Cuban president Jamaica’s prime minister, Bruce Golding told parliament in a tribute to the old Marxist, “We on this side have never been ambivalent about President Fidel Castro during the period of the great ideological divide. We were fierce opponents of the political values as were espoused then, and we expressed that opposition in very forceful terms. “Happily that era is behind us. Jamaica and Cuba today enjoy a relationship that is neutrally respectful and neutrally beneficial. As recently as a few months ago, Cuba provided assistance to us in tackling our significant engineering challenge to rescue the Palisadoes road[damaged by hurricane],” he added. Golding also hailed Castro for his steadfastness, courage, strength of his leadership and his unswerving commitment to the cause of the Cuban people. “There is a transition that will now take place and one of the hopes that we have is that this transition will be a defining moment and that it will enable Cuba to take an unambiguous place in the international community and put an end, once and for all, to the unjustified isolation of the Cuban people,” he said. The Jamaica Information Service reported that opposition leader, Portia Simpson Miller, also hailed the Cuban leader. “I think this afternoon I can say that this morning a legend, a giant and a champion departed the stage of political leadership in his country, Cuba. That giant is Fidel Castro,” she said. She also thanked the Cuban leader for contributing to Jamaica’s education sector by constructing three schools, namely the José Martí High School, Garvey Maceo High School, and the G.C. Foster College of sports. With the possibility of Raul Castro assuming the presidency February 24, and the US anticipating a “pragmatic” governing approach by him, all focus is on the possibility of the lifting of the economic embargo. But as the WSWS observed in 1998, the former British colonies of the West Indies see little advantage to Cuba joining CARICOM.